As I read with disbelief the daily dispatches about North Korean Supreme Leader Kim Jong Un’s bellicose statements about aiming nukes at the United States, threatening South Korea and putting his impoverished country under martial law to “prepare for war,” I know that there are very serious issues hanging in the balance in east Asia. But I can’t get this story, I Can’t Stop Looking at These South Korean Women Who’ve Had Plastic Surgery from a couple of weeks ago out of my head, so I had to comment on it. South Korea is the world’s busiest country for plastic surgergy, especially for women. By some accounts, 20% of South Korean women have had some form of cosmetic work done on their face, with eyelid surgery to add a fold being the most popular cut. This particular surgery’s been popular with Korean women in the U.S. too — back in 2009 I mentioned it in a post about contact lenses that make eyes look like an anime character’s eyes. But in South Korea, the societal pressure has apparently become so strong to conform to certain ideals of “beauty” that young women and men — teenagers — are getting their face sculpted. 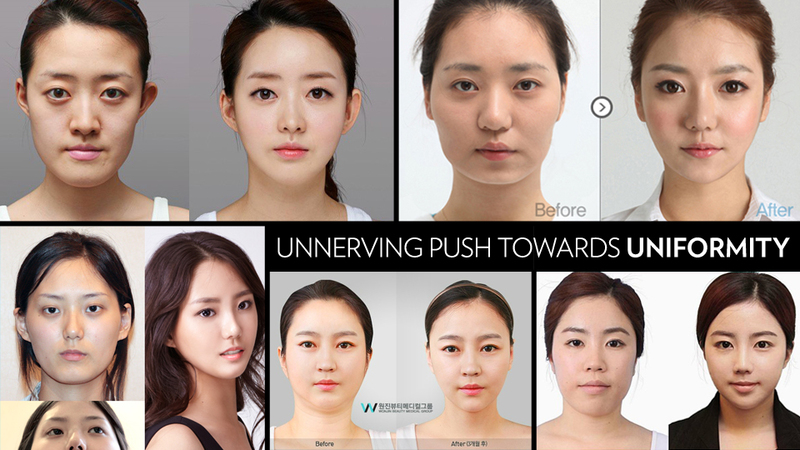 Check out the Korean Plastic Surgery Tumblr blog, which posts an sickening array of before and after photos of Koreans who are unhappy with their appearance. That is, it’s sickening to me. Many of the photos appear to be proud examples of plastic surgeons’ work posted as advertisements to lure in more customers. I’m just saddened that so many young people are willing to manipulate their faces because they have to, to get a better job, or get into a better school. Sure, we all have grown up with the need to conform, to have the latest hair style or the right clothes. “Come on, Dad, John Lennon is cool! Why can’t I have a Beatles cut?” or “Come on Mom, everyone’s wearing denim blue jeans, I can’t wear a polyester pair of jeans from JC Penny!” are real-life refrains from my youth. But hairstyles and fashions are surface accoutrements. Shaving your jawbone to make a narrower cheek and chin, and slicing your eyes to add an epicanthic fold are serious manipulations of your natural body. That’s the kind of stuff that old vain women undergo to try and look young. It’s a shame that young people feel so bad about themselves that they’re going through the procedures before they even get to live life. What are these kids going to look like in 40 years? I don’t have an answer to this problem, and any way to stop the South Korean society from putting this kind of pressure on the next generation. It’s a cultural phenomenon. Hiring managers and companies need to be more open-minded and accepting of differences. People need to celebrate a diversity of appearances. If, in a decade, everyone in the workforce in South Korea has the same, plasticky beautiful look, it’ll just be creepy as hell. Maybe not as creepy as the thought of Kim Jong Un conquering the world, but creepy nonetheless. Great post Gil. For those of you who aren’t Gil, I’m a Korean adoptee and there was a time when I was a lot younger and coveted this surgery to look more like my white family and friends. I remember how I felt when I considered plastic surgery and never in a million years would I imagine people in Korea wanting this for themselves. I guess “beauty” is coveted across cultural lines. Sad. I recall a reality show some years ago, and there were these two brothers (close in age, but not twins I don’t think) who didn’t like their acne problems and large noses, so they both had plastic surgery to make themselves look like Brad Pitt. I mean, come on! Why do people worship celebs like they’re gods or something? They put their pants on one leg at a time just like everyone else, and they don’t crap gold or pee champagne. Brad Pitt is a great actor and seems to be a marvellous guy, but don’t worship him and emulate him in everything. You’re you and he’s him. I think when that show (and others like it) were reported in Newsweek I believe, the headline was , “The Ugliest Shows.” They got that right. I expect many, if not all, these women are both extremely intelligent and talented. 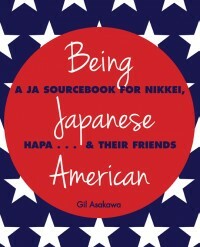 But Asian cultural values hold powerful control over lives. I can understand why these surgeries are so popular, though I wish that weren’t the case. It is sad, but I don’t think the issue is as simple as lack of intelligence causing a misguided search for beauty. Watching the Korean TV Stations noticed that most of the Asian Women there do look alike no Wide jaws or Asian slanted eyes…black hair is going away too.So the Plastic Surgeons are making an army of look alike Asian women. But when the Standard for Beauty is judged by the Caucasian role model…I guess this is what happens. Japanese women are following same path and so are the Chinese…Love of self needs to be re-inforced…we Asians don’t need to look like the Caucasian women—but their children will not look like them unless they start doing plastic surgery on infants. Beauty is in the eyes of the beholder and I prefer the Original Asian Model. I find that very sad, but I think the need to be beautiful really affects the women who become obsessed by the images of the celebrity/ fashion culture. I also think that the need for attention is greater in these kinds of media driven/fame cultural worlds we live in today. To be unique, special, admired, envied and different is driving this, I think it would benefit all of us if we turned away from the popular cultural media machine for 30 days and see how we view ourselves and others through the filters of our own mind and hearts, not something created by the pop media hype machine.